Does it ever feel like you give up pretty quickly after deciding to do something positive for your life? You want to make a big change or add a big skill to start strong but only a few days or sometimes a few weeks later you give up, and we feel bad when this happens. Or do you constantly notice yourself doing things that you know aren’t good for you, aren’t healthy, aren’t positive, aren’t helping you get closer to the life that you ideally would like to live? 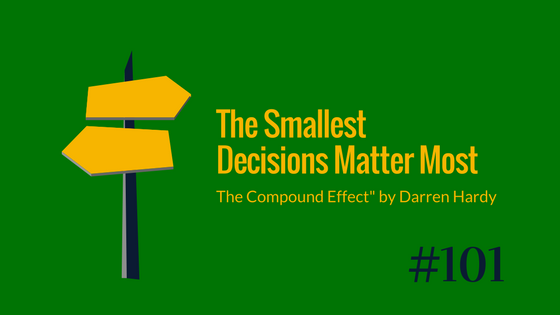 Well, I’m going to talk about a book today called “The Compound Effect” by Darren Hardy, and it’s going to tackle these issues. Most of us struggle at times with reaching our goals, and according to the book “The Compound Effect” this comes down to, this is all based on our daily habits, the choices we make from moment to moment. If this sounds stressful, like “ Well, I’m going to talk about a book today called “The Compound Effect” by Deron Hardy and it’s going to tackle these issues. Most of us struggle at times with reaching our goals, and according to the book “The Compound Effect” this comes down to, this is all based on our daily habits, the choices we make from moment to moment. If this sounds stressful, like “ If this sounds stressful, like “Uh oh, Kevin I don’t want to think about my choices every moment!” it shouldn’t. There are tactics and strategies from the book that we can start applying to our life to help us create daily routines based on our goals. Getting clarity on what we should be doing and what we should not be doing, and also some tips on how to start adding positive habits into our life. So I’m going to talk about some key principles from this book, I hope it’s helpful.